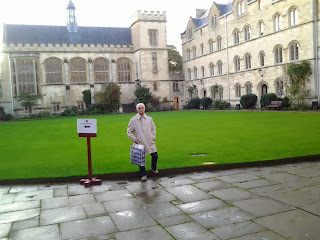 I presented a paper at an Oxford University Roundtable this past October. I've presented papers I've written before—in the universities I've attended here in the states, specifically LaSalle and Rider, but they were essentially classroom discussions. Oxford was different. It was the big leagues. Hell, man; it was OXFORD! Of course the universities that conferred degrees upon me were not the minor leagues, mind you, but, I mean…hell, this was Oxford! 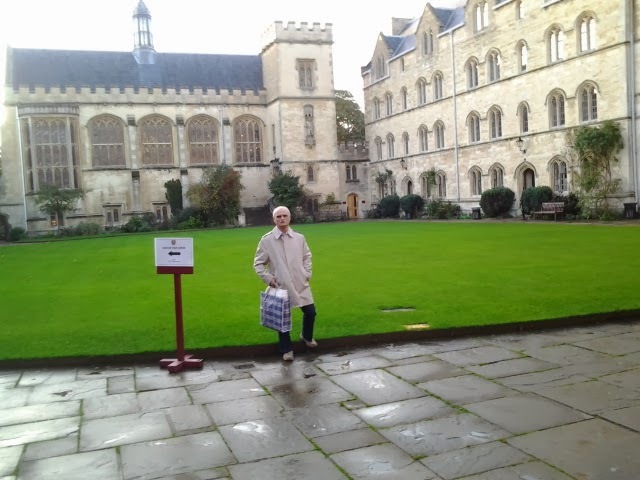 I didn't see much of London, outside of Heathrow Airport, during the four days I was in England, but I had some spare time to socialize with and get mildly assimilated among the British general public in Oxford (when I wasn't hanging out with the profs). The easiest way to express my opinion about the experience is to repeat the answer I gave my wife when she picked me up at Philadelphia International and asked, “How was England?” I told her I would move there tomorrow, if it were practical. show up at my hotel until 7 p.m. the evening before I left to come home. So she quite naturally expected me to start wailing about what a disaster my expedition to the UK just had to be. Consequently, my appearances at Oxford the first day, the second day, and the third day, were in the blue jeans I wore for travel. They were new, pressed, and presentable (pun intended), but they were jeans. And hell, man; this was Oxford! And here I was standing in front of (to me) academic aristocracy pontificating on the state of contemporary higher education. Serendipitously, I discovered that my audience was concentrating on the content of my presentation and not at all concerned about my élan (or lack thereof). This, in retrospect, is exactly what I should have expected. They were interested enough in my topic and sympathetic enough about my wardrobe limitations to make me feel a legitimate part of the group. Nor did the British cordiality end at the gates of the university. Oxford—the city—is a college town and accordingly is heavily populated by students, most of whom get from here to there on bicycle. They (and their bikes) are all over the place. They ride with the traffic in the streets and follow strict traffic rules, including stopping for red lights, wearing helmets, using hand signals, and being equipped with their own lighting. Whenever cyclists ventured onto the sidewalk, they dismounted and walked their bikes. And if a pedestrian was standing in the way, they waited until the walker moved! Really! Oh, and by the way, there was an endless queue (another word I latched onto in England) of bicycles parked along the walls, fences, and sidewalks adjoining the university. I did not see one that had a lock attached. I have to tell you, when the townspeople—students, shopkeepers, professors, taxi drivers, bus drivers, shoppers—are outwardly cordial, and bikes are left unlocked, and the intelligentsia is actually interested in what you came there for…well…that’s a place I could move to. Did I mention that it was Oxford? Jim - were you in Oxford England or Oxford PA? The flight was seven hours, so I just assumed I was in England.